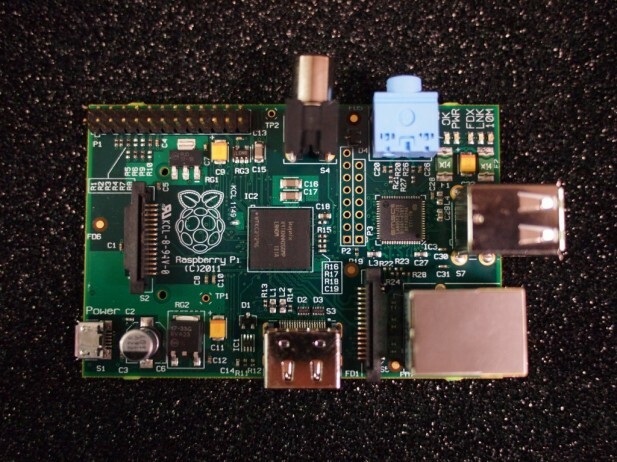 The British not-for-profit foundation Raspberry Pi is planning to launch its Raspberry Pi board next month. The board is based on a Broadcom ARM11 processor running at 700MHz and sports 128MB of DRAM. Storage comes via a USB 2.0 connection and a slot for an SD/MMC card that can hold up to 32GB of flash. Finally the board also has an Ethernet connector. Raspberry Pi $25 computer. Photo courtesy of Raspberry Pi. The computer is initially aimed at the educational market and the first production run will encompass 10,000 devices that are powerful enough to play Quake and show HD movies in 1080p quality. The boards will be sold via the web and all you have to add yourself is a TV, keyboard, mouse and some kind of storage. You will also be able to download a minimalistic Linux distribution that runs efficiently on the hardware. Connection to the TV is via a standard HDMI-connector, according to Raspberry Pi. According to a recent interview with Business Insider that the aim was to build a computer so cheap, it could be handed out to children like textbooks. “Children are enormously illiterate now, but what they know how to do is use computers. They see them as bits as functional magic and have no idea how they work. That’s fine for Facebook and browsing, but if you want a career out of this stuff or create something that’s high value, you have to understand how the thing works,” Upton said.